Disruptive innovation theory – what is it actually all about? Disruption has indeed become a buzzword! In such an extent that even our law company is hosting an event with the headline “Digitalization and disruption – from buzzword to business” (which we will attend, so stay tuned on that later this month). But what is a disruptive innovation really? The founding father, Clayton M. Christensen defined and analysed the phenomenon back in 1995 and describes the term as an innovation that creates a new market and value network – eventually disrupting an existing market and value network – displacing established market leading firms, products and alliances. In retrospect, this theory and phenomenon actually allows us to understand some of the developments and game changers back in the day, which at the time were surprising. Often they were described as a streak of luck – a classic Davis versus Goliath tale. You might envision David versus Goliath as the story of a weak shepherd defeating a mighty warrior. Goliath the Philistine giant armed warrior, going against David, a shepherd armed only with his staff, sling and five stones. The underdog wins the battle by hitting the giant right between the eyes with his sling. He wins the battle partially because he is underestimated and ridiculed by the mighty Goliath. But is it really the story of an underdog that wins a battle with luck? The next time you hear about a David versus Goliath story, don’t think of an underdog. Think of a confident competitor who is more than happy to be underestimated. And who is equipped with the right tools to take on a much bigger opponent. First, let us deal with a popular misconception about disruptive innovation theory: “A disruptive innovation is not a breakthrough innovation that makes good products a lot better” (Clayton M. Christensen). Disruptive innovations transform complicated, expensive products into simpler and more affordable ones. Let’s look at an example of disruptive innovation in the computer industry, with 3 circles representing the market. The inner circle represents the customers who have most resources and best access to a product or service. The larger circles represent larger populations of customers who have progressively less money. Often, companies are found to be in the inner circle, as the first products and services are too costly and complicated to be of actual relevance for the masses. ‍Example of disruptive innovation theory using the computer industry and how the market was disrupted by new products that were simpler, more affordable and available. The mainframe computer was complicated and very expensive and had a gross margin of $1,000,000. Along came the personal computer, which had a gross margin of $700. Mainframe companies did not really see it as a legitimate threat and continued to improve the mainframe computer, largely because of the large gross margin in the industry. When the personal computer became the state of the art, the smartphone became the new innovation to disrupt the current market with a gross margin of $80. HP, Dell and Lenovo did not take much notice of the smartphone and decided that it did not make sense for them – after all the gross margin was not as high as in their current market. All three products in the example disrupted the current market by being simpler and more affordable. 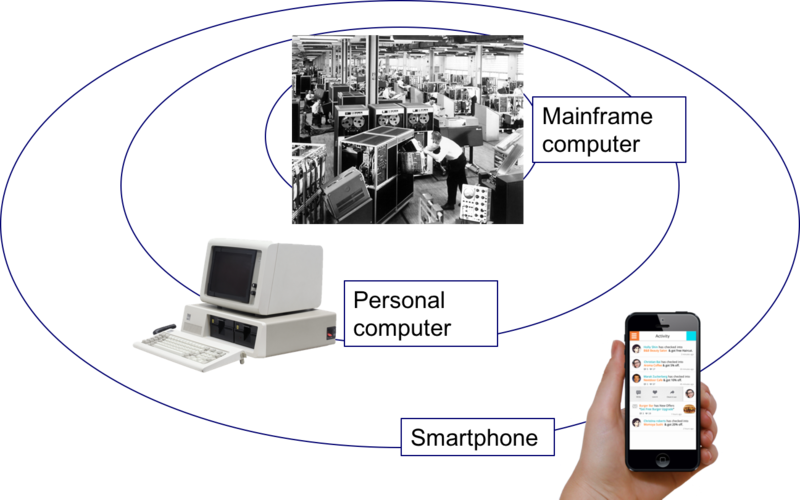 Consider disruption innovation theory when creating new products – as with the example with the mainframe computer. If you think differently, you also avoid being in direct competition with the huge players in your market (from the inner circle), who with their strength and resources will kill you! It is not necessarily a good strategy to focus on a current product and making it better. The mainframe computer was improved, but in the meantime a new product, the personal computer, was developed and made the mainframe computer obsolete. Therefore, think beyond improving a current product by adding more features. After all, the greatest success stories are seen when a new product is able to create a new market and address a new need. The mainframe computer was only available for a few giants and addressing their jobs to be done. Make sure to focus on availability when developing products and services – how can you address new jobs to be done and attack the current market differently?